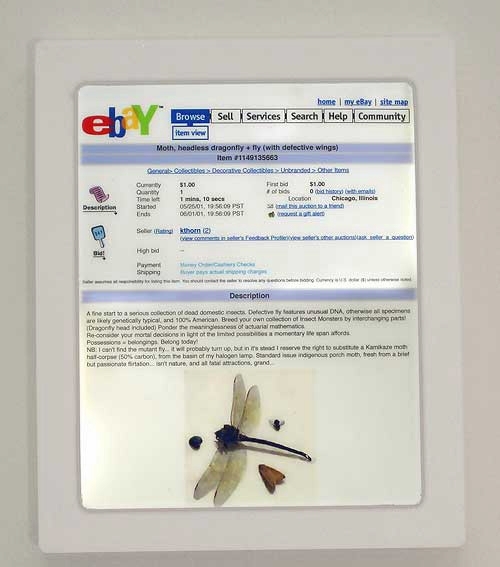 The original series of ebay works [e-valuation series] recreated in lightbox form. For exhibition purposes, it seems somehow illogical to devote a computer to an archived internet work, which is no longer live, yet not especially interactive in terms of its interface. A computer in the corner of a gallery often acts as a less than inviting form, considering other, less multi-layered works in an exhiibition space. The lightboxes provide a means to display the idea of the work, well beyond its internet lifespan. Materials: Lasercut plexiglass, voltage inverter and cold cathode tubes.